I haven't entered an I Heart Faces challenge in a while, but I knew I had the perfect picture for the bust a gut challenge. A couple of weeks ago while shooting the precious Dandeneau family, I was getting some of the mom and her two grown daughters when they got the giggles... or more like the gut busting laughs! I love this! My mom is my best friend and this picture just touches my heart! Clicked through from I *heart* faces! 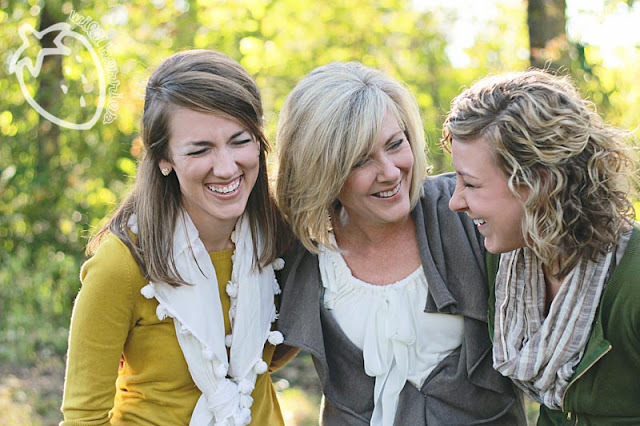 Um, so what's the mom's secret to looking like she's one of the sisters? Great capture, I love it! Aw, what a great capture! They will surely treasure this picture! Love it - so fun! That is one beautiful collection of women! Great shot.